Are You Protecting Everything You Should? Odds are that you may not be protecting all of your business-critical data from a disaster. You know that your data needs to be protected-and that backup is an important component of a DR strategy. But the truth is that backup by itself does not guarantee that you'll be able to recover data quickly and easily. And business users have come to expect nearly instant recovery for ALL data, even for applications that are not mission critical. Why is replication so important? Replication minimises the size of data copies between primary and secondary sites and reduces the impact of latency to maintain performance over a WAN. Implementing Drobo iSCSI SAN storage with Visual Solutions Double-Take Availability running on virtualised servers is an affordable solution that provides superior data protection with Drobo BeyondRAID™ technology. And the incredible ease-of-use is a huge plus for deploying and growing Drobo storage. Odds are that you are not protecting all of the data in your business from a disaster. Enterprise disk-to-disk replication for DR may be a great fit and already in use for some of your applications. However, companies—large or small—are not currently protecting all of their applications and data due to the prohibitive cost. Are you? It goes without saying why business data needs to be protected from disasters, and companies from ten to ten thousand users need data protection just the same. Backup is an important component of a data protection strategy, but it does not provide the recovery point objectives (RPO) or recovery time objectives (RTO) that business users prefer. Face it, business users have come to expect nearly instant recovery, even for applications that are not mission critical. DR with replication provides better RPOs and RTOs compared to backup, and complements backup for applications that must be recovered more quickly than backup alone can provide. Even if replication is already in place for larger applications, odds are that more applications need it. A great deal goes on under the covers of data replication, with countless publications documenting the details. At a basic level for SMBs and departments, data is continuously copied between primary and secondary, so that both are very close to being in-sync. High-end storage devices can perform this function, as can application appliances or servers themselves with special replication software. In the event of a disaster, protected applications can fail over to the secondary site across a campus, across town, or over a long distance. Replication solutions optimise the data communication between primary and secondary sites, making it more efficient to work around the characteristics of the network between sites. Simply copying data between sites cannot compare with replication because of latency and bandwidth. The monthly cost of the network is often the most expensive part DR, so unlimited capacity is not feasible. Replication technology minimises the size of data copied between sites and reduces the impact of latency to maintain performance over a wide area network (WAN). Install Drobo Dashboard on management server (can be on vCenter server or a VM). 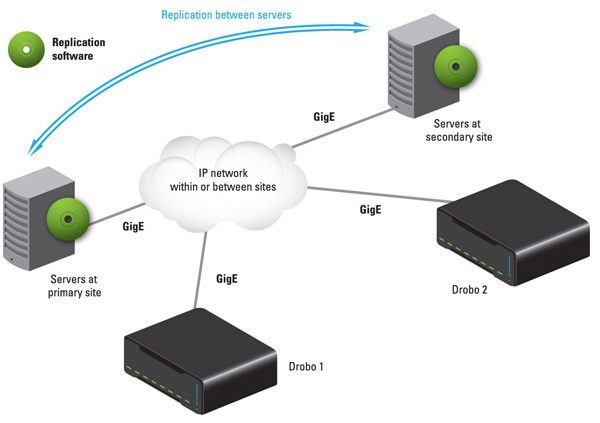 Deploy iSCSI SAN storage, easy automatic setup with Drobo, configure Smart Volumes. Configure network to enable communication between sites (can be done in advance). Install Double-Take Availability software on your servers, no reboot required on modern shipping Windows server OSs (Windows 2000 or earlier requires reboot). Configure Double-Take using the setup wizards—and you have DR! Test your DR failover anytime, it's easy (simply click "failover"). Double-Take Availability and connected to Drobo iSCSI SAN. SAN storage is a must if you want to maximise mobility and flexibility for DR. Fibre Channel SANs have a high entry cost, preventing companies with smaller configurations and budgets from participating. iSCSI can be lower in price, but even the lowest-cost iSCSI storage that includes built-in replication is still quite expensive by most measures. Even when users can afford one iSCSI array, they often cannot afford the second one they need for DR.
Drobo provides superior data protection with BeyondRAID™ technology in a package that is very affordable. Without the cost burden of disk-to-disk replication, customers can add a second array they need for DR or buy the two iSCSI SAN arrays they need for DR at less than half the cost of comparable solutions with replication built in. And the incredible ease of use is a huge plus for deploying and growing Drobo storage! With a host-based architecture for DR, users can select only the most critical applications for failover, reducing cost and complexity. Moreover, this approach allows for dissimilar hardware for primary and secondary storage, a huge cost saving. The DR site can be sized to run just critical applications vs. "everything" with the expectation that a small business would run from the DR site for a short time until the primary site can be recovered. With Drobo, DR doesn't have to be so costly and it doesn't have to be so hard either!